The International Phonetic Alphabet (IPA) is a set of symbols representing the sounds of natural languages. 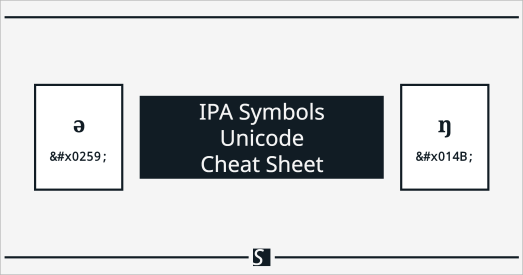 This cheat sheet lists IPA symbols along with their names, phonetic descriptions, and Unicode hexadecimal forms. Sounds are ordered by IPA number and grouped by series. Please see my notes and references for additional information. All data can be found in my GitHub repository, IPA Data. Changes to the data are noted in my IPA Data repository’s changelog. I used the dotted circle (◌) in the representation of IPA symbols with composing characters (e.g., IPA402) and to denote the position of modified sounds (e.g., IPA665). In these cases, Unicode hexadecimal forms exclude the dotted circle (◌). This cheat sheet performs best with Google Noto Fonts installed, and I attempt to load uninstalled fonts with Web Font Loader. If neither condition is met, IPA symbols will fail to display and you might see ‘tofu’ (e.g., □). My thanks to Dr. John Esling, Professor Emeritus of Linguistics at the University of Victoria, for discussions regarding phonetics and the IPA. International Phonetic Association. (1999). Handbook of the International Phonetic Association: A guide to the use of the International Phonetic Alphabet . Cambridge: Cambridge University Press. Steffanick, A. (2017). IPA Data .